I'm playing the Final Fantasy X HD Remaster on my Vita and I'm loving it. The remaster is also available on PS3 or you can grab the original game on PS2. Final Fantasy X is such a great game in the series. It's another leap forward in console generations since it's the first Final Fantasy game on PS2. I always knew that Final Fantasy IX and Final Fantasy X were some of my favorites and this playthrough of Final Fantasy X is reaffirming that. The setting is a technologically repressed world where a giant monster called Sin runs rampant. Sin kills and destroys for no apparently reason. An entire religion had been built around Sin and it's effects. One of the outcomes of the religion is a group known as Summoners. They can call on powerful mystical creatures known as Aeons to help them. Summoners must journey throughout the world on a pilgrimage to gather all the Aeons. Once they have done so, they can conduct a final summoning to banish Sin for a number of years. 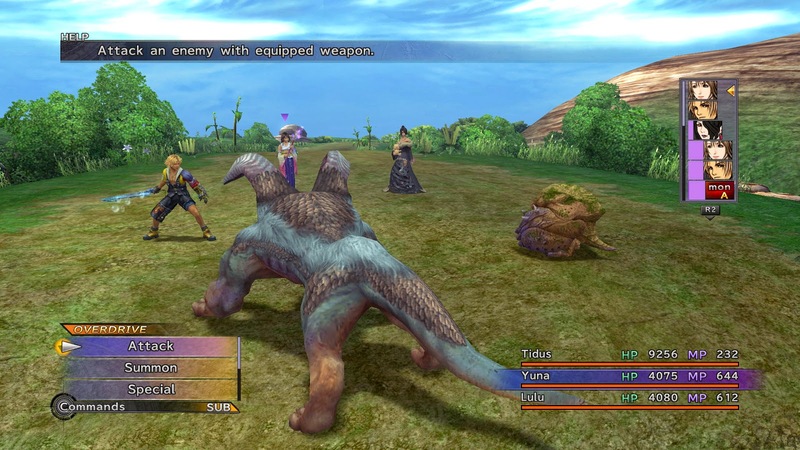 The main characters of the story are a Summoner, Yuna, and the guardians that travel with her on her pilgrimage. 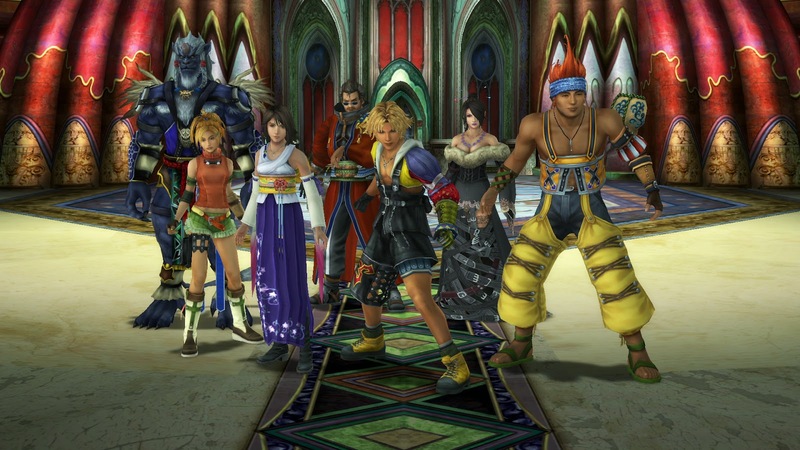 Tidus is the player controlled character, but all of the characters play a major role and are very fleshed out. I think this Final Fantasy game has some of the most unique characters in the series. There's a great variety to them. Wakka is a religious technophobe with a love of Blitzball, the worldwide sport. Lulu is a thoughtful black mage who was going to marry Wakka's younger brother before he was killed. Kimari is an outcast from a race known as the Ronso and has been Yuna's guardian since she was a child. Rikku is a thief from a group of people who ignore the religious teachings and work with machines. And Auron, a mysterious figure from both Yuna and Tidus' past. He has already completed a pilgrimage and has reappeared to help again. Not to mention Yuna and Tidus. Yuna is the most interesting character. Her father was a summoner who completed the final summoning and died in the process, but managed to banish Sin for a time. She is driven to follow in his footsteps and finds a lot of strength and courage along the way. Tidus is surprisingly flat compared to the other characters, but it's probably so that you, as the player, can pour some of yourself into him. He's a Blitzball player from an unkown place who was abandoned by his father at a young age. 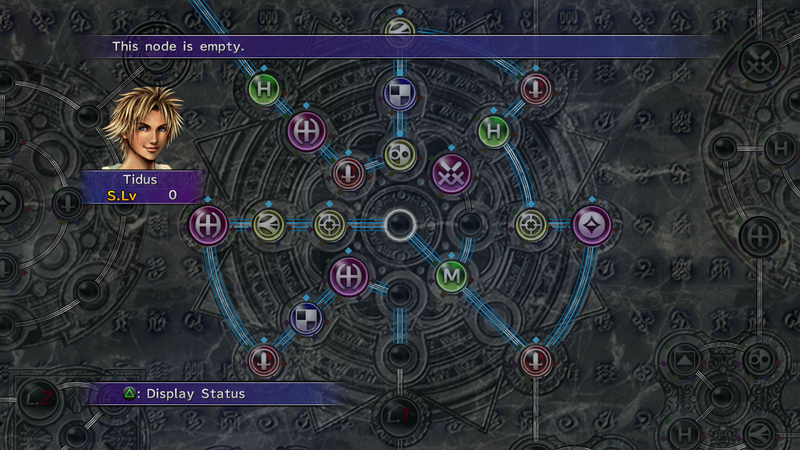 Everything beyond that is basically Tidus just trying to figure out how this world works in comparison to his own. The story and characters are really the stars of the show here. With the leap forward from the PSX era to the PS2 era the developer was finally able to get characters to feel like humans. They're all realistically proportioned, well animated, and are fully voiced. Not to mention the graphics are so much better than the PSX era games. Finally, our characters don't look blocky or misproportioned. This is one of the first RPGs with a lot of voice acting. Occasionally, you may run into an NPC with one line of dialogue that isn't important and they won't be voice acted. But all the main characters and re-occurring side characters are voiced at all times. The voice acting alone gives Final Fantasy X a different feel compared to every other game in the series. Up until now, all of the emotion and inflection from characters has been done in our heads via text that we read. Now the characters add emotion and variety on their own. To it's credit, it usually succeeds. There are a few cringeworthy lines and situations, but for the most part the voice acting works well. And that's just one of the huge differences between console generations. The other immediately noticeable change is the 3D world. The 2D hand-painted backgrounds of the PSX era are gone and in their place is a 3D rendered world to explore. The world is tied together by a beautifully crafted soundtrack. In my opinion, this is the best overall soundtrack in any Final Fantasy game. It perfectly compliments the world and adds a sense of depth to it. While some individual tracks from other Final Fantasy games are better, there is no better soundtrack when taken as a whole. Let's talk battle and progression. The battle system finally moved away from the ATB system that has been in place since Final Fantasy IV. That's six games in a row with essentially the same turn-order mechanic. 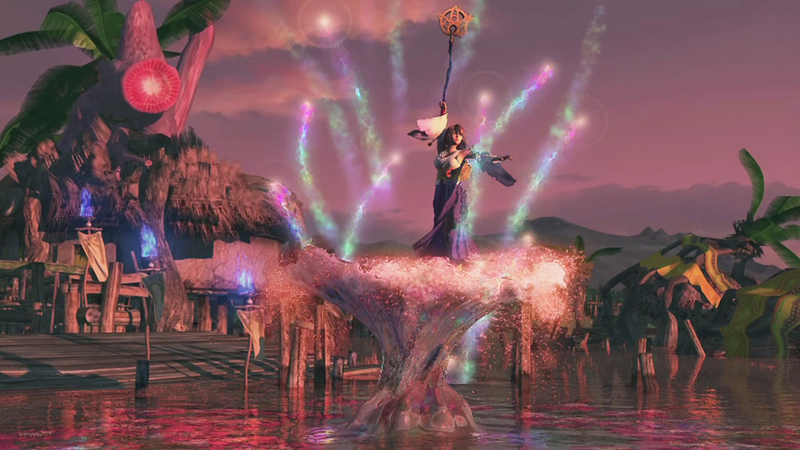 In Final Fantasy X we have returned to a purely turn-based system. There are no timers running and turn order is clearly displayed on the right side of the screen. Personally, I love this. It gives me plenty of time to think about what I want to do and execute the best action. No need to feel rushed or pressured. It also means that, if I know what to do, battles can go very quickly because I don't have to wait for an ATB gauge to fill. I don't know why they stayed away from turn-based combat for so long. While only three party members are active in battle they can be switched at any time. It's great to be able to leave your white mage out of battle until you need her, swap her in for a couple turns to heal everyone up, and then replace her with another damage dealer. In the last few games I felt like I had a core team that I would always take into battle. Some characters got a ton of play time from me and some basically got left out. In Final Fantasy X it truly feels like your party is working together. Each member of the party can help in every battle. Why not have everyone contribute? It makes a lot more sense than sending a few characters into battle while everyone else stands around twiddling their thumbs... I'm looking at you Final Fantasy VI through IX. Battles give points which upgrade sphere levels. Sphere levels are a little weird at first. They're basically movements points on a giant progression board called the Sphere Grid. You can choose where to move around the Sphere Grid and which nodes to activate. Every activated node gives an increase in stats or unlocks a new ability. It's interesting. It's unique. I don't really like it. While you are given the "freedom" to move around as you see fit, there is really only one correct path for each character (except Kimari, he's weird). Each character starts in a different area of the Sphere Grid and they are basically forced along an optimal path for much of the game. It really comes down to being an overly complicated way to level up. It's a cool idea, but I think it falls a little flat. While I don't have much negativity about the game, I should mention the linearity. I didn't remember from my original play through but Final Fantasy X is very linear. Paths twist and turn but generally there is a single corridor that you're ushered down. There's no open world map to explore. You're kind of railroaded to the next plot point. At least there are towns along the way to break up the linear corridor feeling to the game. And there are still side activities like Blitzball and other mini games. But while playing through the main story it's basically one path to follow. All of this being said, I think that Final Fantasy X is the perfect game for a newcomer to the Final Fantasy series. This is where I always recommend that new players start. It's not too hard, it has a lot of modern gaming conveniences, it's fully voice acted, has relatable characters, and you won't get lost along the way. Since it's available on PS2, PS3, and Vita it's also very accessible. If someone asks you where to start, point them at Final Fantasy X. This has been much more extensive than my previous initial impression posts. Currently I'm about 6 hours into the game but Final Fantasy X just has so much to talk about. I'll definitely write a wrap up when I'm finished, but I may do a few one off posts in between. We'll see. For now, I'm just going to play and keep enjoying the game.